This tragi-comedy is considered Marston’s masterpiece, full of reversals and transformations, surprises and disguises. A bitter satire, suffused with savage irony throughout, the play is a timely reminder of the worst excesses of fallen humanity driven by lust and ambition. It also demands great musical resources. 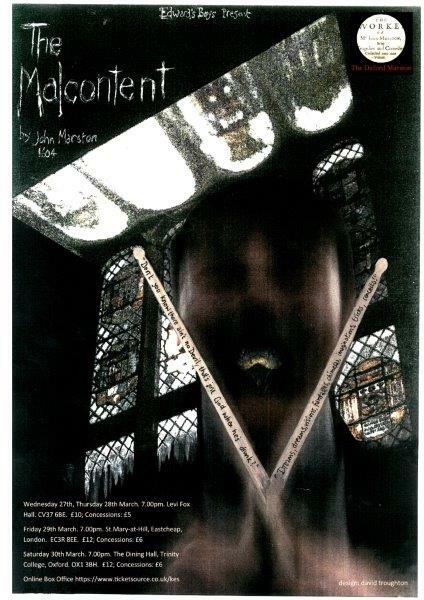 First performed in 1604 at the Blackfriars by “the Children of Her Majesty’s Revels”, one of the two leading boys’ companies of the day, The Malcontent is presented by Edward’s Boys at the request of the Oxford Marston Project. The production marks the ongoing publication of The Complete Works of John Marston. When published, this will be the first complete critical edition of the work of this neglected playwright whose output included comedies, tragedies, tragi-comedies and verse satires. This is the fourth time Edward’s Boys have taken on Marston, following acclaimed productions of The Dutch Courtesan in 2008, Antonio’s Revenge in 2011, and the public workshop on four of his plays for the Project at the Sam Wanamaker Playhouse in June 2017.